Legged locomotion, such as walking, running, turning, and jumping depends strongly on the dynamics and the biological characteristics of the body involved. Gait patterns and energy efficiency, for instance, are known to be greatly affected, not only by travel speed and ground contact conditions but also by body structure such as joint stiffness and coordination, and foot sole shape. To understand legged locomotion principles, we must elucidate how the body’s dynamic and biological characteristics affect locomotion. Efforts should also be made to incorporate these characteristics inventively in order to improve locomotion performance with regard to robustness, adaptability, and efficiency, which realize more refined legged locomotion. For this special issue, we invited our readers to submit papers with approaches to achieving legged locomotion based on dynamic and biological characteristics and studies investigating the effects of these characteristics. In this paper, we review studies on dynamically and biologically inspired legged locomotion. T. Kinugasa and Y. Sugimoto, “Dynamically and Biologically Inspired Legged Locomotion: A Review,” J. Robot. Mechatron., Vol.29, No.3, pp. 456-470, 2017. K. Hosoda, “Soft humanoids,” Kagaku Dojin Publishing Co., Inc., 2016 (in Japanese). T. McGeer, “Passive Dynamic Walking,” CSS-IS TR 88-02, 1988. S. Collins, A. Ruina, R. Tedrake, and M. Wisse, “Efficient Bipedal Robots Base on Passive Dynamic Walkers,” Science, No.5712, pp. 1082-1084, 2005. T. McGeer, “Passive Dynamic Running,” Proc. of the Royal Society of London, Series B, Bio. Science, Vol.240, No.1297, pp. 107-134, 1990. D. Owaki, M. Koyama, S. Yamaguchi, S. Kubo, and A. Ishiguro, “A 2D passive-dynamic-running biped with elastic elements,” IEEE Trans. on Robotics, Vol.27, No.1, pp. 156-162, 2011. T. McGeer, “Passive dynamic biped catalogue,” Section 9: legged locomotion, Experimental Robotics II, 2005, Vol.190, pp. 463-490, 1991. A. Sano, “Dynamic biped walking by using skillfully a gravity field (challenge to a human walking),” J. of the Robotics Society of Japan, Vol.11, No.3, pp. 52-57, 1993 (in Japanese). Y. Ikemata and A. Sano, “Phenomenon, principle and Application of Passive Dynamic Walking,” J. of the Robotics Society of Japan, Vol.30, pp. 350-355, 2012 (in Japanese). R. Margaria, “Biomechanics and energetics of muscular exercise,” Oxford U. K. Clarendon Press, 1976. T. Kinugasa and K. Yoshida, “Stability of a wheel with Various Radius Rim,” Trans. of the Institute of Systems, Control and Information Engineers, Vol.22, No.3, pp. 116-122, 2009 (in Japanese). M. J. Coleman, “Motions of a rimless spoked wheel: a simple 3d system with impacts,” Dynamics and Stability of Systems, Vol.12, pp. 139-160, 1997. J. Yan and S. K. Agrawal, “Rimless wheel with radially expanding spokes: Dynamics, impact, and stable gait,” Proc. of Int. Conf. on Robots and Systems, pp. 3240-3244, 2004. Y. Tazaki and J. Imura, “A Study of the Energy-Saving Effect of Foot Shape on Planar Passive Bipedal Walking,” J. of the Robotics Society of Japan, Vol.23, No.1, pp. 131-138, 2005 (in Japanese). F. Asano and M. Suguro, “Limit cycle walking, running, and skipping of telescopic-legged rimless wheel,” Robotica, Vol.30, No.6, pp. 989-1003, 2012. Y. Ikemata, T. Otake, A. Sano, and H. Fujimoto, “A basic study for passive running by rimless wheel with springs,” Trans. of the Japan Society of Mechanical Engineers, Vol.76, No.766, pp. 140-146, 2010 (in Japanese). F. Asano, “Efficiency and optimality of 2-period gait from kinetic energy point of view,” Trans. of the Institute of Systems, Control and Information Engineers, Vol.23, No.9, pp. 197-206, 2010 (in Japanese). F. Asano, R. Inoue, D. Tanaka, and I. Tokuda, “Passive dynamic walking of combined rimless wheel and its efficiency analysis – speeding-up by adjustment of phase difference between fore and rear legs,” J. of the Robotics Society of Japan, Vol.30, No.1, pp. 107-116, 2012 (in Japanese). D. Tanaka , F. Asano, and I. Tokuda, “Gait Analysis and Efficiency Improvement of Combined Rimless Wheel with Wobbling Mass,” Trans. of the Society of Instrument and Control Engineers, Vol.49, No.9, pp. 865-874, 2013 (in Japanese). H. Miura and I. Shimoyama, “Dynamic Walking of Biped,” Int. J. of Robotics Research, Vol.3, No.2, pp. 60-74, 1984. A. Goswami, B. Thuilot, and B. Espiau, “Compass-like biped robot, part I: Stability and bifurcation of passive gait,” Research Report, No.2996, 1996. A. Goswami, B. Thuilot, and B. Espiau, “A study of the passive gait of a compass-like biped robot: symmetry and chaos,” Int. J. of Robotics Res., Vol.17, No.12, pp. 1282-1301, 1998. M. J. Coleman, M. Garcia, A. L. Ruina, J. S. Camp, and A. Chatterjee, “Stability and Chaos in Passive-Dynamic Locomotion,” IUTAM Symposium on New Applications of Nonlinear and Chaotic Dynamics in Mechanics, Vol.63, pp. 407-416, 1999. M. Garcia, A. Chatterjee, and A. Ruina, “Speed, efficiency, and stability of small-slope 2-D passive dynamic bipedal walking,” Proc. on Int. Conf. on Robotics and Automation, 1998. K. Osuka and K. Kirihara, “Motion analysis and experiment of passive walking robot quartet II,” J. of the Robotics Society of Japan, Vol.18, No.5, pp. 737-742, 2000 (in Japanese). M. Garcia, A. Chatterjee, A. Ruina, and M. Coleman, “The simplest walking model: Stability, complexity, and scaling,” J. of Biomech. Eng., Vol.120, pp. 281-288, 1998. A. L. Schwab and M. Wisse, “Basin of attraction of the simplest walking model,” Proc. of ASME Int. Conf on Noise and Vibration, 2001. I. Obayashi, S. Aoi, K. Tsuchiya, and H. Kokubu, “Formation mechanism of a basin of attraction for passive dynamic walking induced by intrinsic hyperbolicity,” Proc. of the Royal Society A, 2016. K. Hirata and H. Kokame, “On Periodic Motion of Linear Systems with State Jump: Modelling, Stability Analysis and Feedback Control of Compass Walking,” Trans. of the Institute of Systems, Control and Information Engineers, Vol.17, No.12, pp. 553-560, 2004 (in Japanese). Y. Sugimoto and K. Osuka, “Stability Analysis of Passive Dynamic Walking An Approach via Interpretation of Poincaré Map’s Structure,” Trans. of the Institute of Systems, Control and Information Engineers, Vol.18, No.7, pp. 255-260, 2005 (in Japanese). K. Hirata, “On Internal Stabilizing Mechanism of Passive Dynamical Walking,” SICE JCMSI, Vol.4, No.1, pp. 29-36, 2011. K. Osuka, A. Ishiguro, X.-Z. Zheng, Y. Sugimoto, and D. Owaki, “Implicit control law embedded in control system solves problem of adaptive function! ?,” J. of the Robotics Society of Japan, Vol.28, No.4, pp. 491-50, 2010 (in Japanese). D. Owaki, K. Osuka, and A. Ishiguro, “Understanding of the common principle underlying passive dynamic walking and running,” Proc. of Robotics Symposia, pp. 441-445, 2009 (in Japanese). Y. Ikemata, A. Sano, and H. Fujimoto, “A stability mechanism of the fixed point in passive dynamic walking,” J. of the Robotics Society of Japan, Vol.23, No.7, pp. 839-846, 2005 (in Japanese). Y. Ikemata, A. Sano, and H. Fujimoto, “Robust Passive Walking Based on a Global Stabilization Principle of Fixed Point,” J. of the Robotics Society of Japan, Vol.26, No.2, pp. 178-183, 2008 (in Japanese). A. Takahashi, A. Sano, Y. Ikemata, and H. Fujimoto, “Realization of passive walking lasted for 13 hours,” Proc. of SICE 10th Conf. on System Integration SI2009, pp. 1327-1328, 2009 (in Japanese). A. D. Kuo, “A simple model of bipedal walking predicts the preferred speed-step length relationship,” J. of Biomechanical Engineering, Vol.123, No.3, pp. 264-269, 2001. F. Asano and Z. W. Luo, “Dynamic walking analyses of underactuated biped robot that added upper body by means of bisecting hip mechanism,” J. of the Robotics Society of Japan, Vol.26, No.8, pp. 932-943, 2008 (in Japanese). M. Haruna, M. Ogino, K. Hosoda, and M. Asada, “Yet Another Humanoid Walking – Passive Dynamic Walking with Torso under Simple Control –,” Proc. of Intelligent Robots and Systems, 2001. Y. Ikemata, A. Sano, and Y. Kato, “Analysis of passive walking that added upper body by means of hip spring-damper mechanism,” Trans. of the Japan Society of Mechanical Engineers, Vol.78, No.796, pp. 131-141, 2012 (in Japanese). T. Kinugasa, Y. Hashimoto, and H. Fushimi, “Passive Walking of Biped Emu with Attitude Control of Body – Stability Analysis and Experiment of Walking –,” J. of the Robotics Society of Japan, Vol.22, No.2, pp. 200-206, 2004 (in Japanese). M. Wisse, A. L. Schwab, and F. C. T. V. D. Helm, “Passive dynamic walking model with upper body,” Robotica, Vol.22, pp. 681-688, 2004. M. Wisse, D. G. E. Hobbelen, and A. L. Schwab, “Adding an upper body to passive dynamic walking robot by means of a bisecting hip mechanism,” IEEE Trans. on Robotics, Vol.23, No.1, pp. 112-123, 2007. A. H. Hansen, D. S. Childress, and E. H. Knox, “Roll-over shapes of human locomotor systems: effects of walking speed,” Clinical Biomechanics, Vol.19, No.4, pp. 407-414, 2004. M. Wisse, D. G. Hobbelen, R. J. Rotteveel, S. O. Anderson, and G. J. Zeglin, “Ankle springs instead of arc-shape feet for passive dynamic walkers,” Proc. of Int. Conf. on Humanoid Robts, pp. 110-116, 2006. Y. Hanazawa and M. Yamakita, “Flat foot passive dynamic walking with ankle inerters,” Trans. of the Japan Society for Simulation Technology, Vol.3, No.4, pp. 89-99, 2011 (in Japanese). Y. Hanazawa, H. Suda, and M. Yamakita, “Realization of high-speed flat-footed passive dynamic walking using ankle inerters,” J. of the Robotics Society of Japan, Vol.31, No.8, pp. 721-729, 2013 (in Japanese). M. Raibert, “Legged robot that balance,” MIT Press, 1986. A. D. Kuo, “Stabilization of lateral motion in passive dynamic walking,” Int. J. of Robotics Res., Vol.18, No.9, pp. 917-930, 1999. M. Wisse, A. L. Schwab, and R. Q. v. Linde, “A 3D passive dynamic biped with yaw and roll compensation,” Robotica, Vol.19, No.3, pp. 275-284, 2001. S. H. Collins, M. Wisse, and A. Ruina, “A three-dimensional passive dynamic walking robot with two legs and knees,” Int. J. of Robotics Research, Vol.20, No.2, pp. 607-615, 2001. M. Wisse and R. Q. v. d. Linde, “Delft pneumatic bipeds,” Springer-Verlag Berlin Hidelberg, 2007. M. Wisse, “Passive-based walking robot,” IEEE Robotics & Automation Magazine, Vol.14, No.2, pp. 52-62, 2007. T. Kinugasa, K. Yoshida, K. Kotake, A. Fujimura, H. Tanaka, and K. Ogawa, “3D Passive walker with ankle springs and flat feet,” J. of the Robotics Society of Japan, Vol.27, No.10, pp. 1169-1172, 2009 (in Japanese). T. Kinugasa and K. Yoshida, “3D Passive Dynamic Walkers with Flat Feet and Ankle Springs: Experiment and Analysis For Longer and More Stable Step,” Proc. of Int. Symp. on Mobiligence, pp. 425-430, 2009. T. Narukawa, K. Yokoyama, and M. Takahashi, “Numerical and experimental studies of planar passive biped walker with flat feet and ankle springs,” J. of Systems Design and Dynamics, Vol.4, No.6, pp. 848-856, 2010. T. Kinugasa, T. Akiyama, M. A. Idris, K. Yoshida, and M. Iribe, “Experimental Analysis of 3D Passive Dynamic Walking: body’s shape, CoM and stability,” Proc. of SICE Annual Conf., pp. 1825-1830, 2010. S. Nishiyama, Y. Nomura, and S. Sato, “Estimation of zero moment point trajectory during human gait locomotion based on a three-dimensional rigid-link model,” Technical report of IEICE, Vol.101, No.734, pp. 59-64, 2002. T. Kinugasa, T. Ito, H. Kitamura, K. Ando, S. Fujimoto, K. Yoshida, and M. Iribe, “3D dynamic Biped Walker with Flat Feet and Ankle Springs: Passive Gait Analysis and Extension to Active Walking,” J. of Robotics and Mechatronics, Vol.27, No.4, pp. 444-452, 2015. K. Hyodo, T. Oshimura, S. Mikami, and S. Suzuki, “Stabilizing Passive Dynamic Walk Under Wide Range of Environments by Constraint Mechanism Fitted to Sole of Foot,” J. of Robotics and Mechatronics, Vol.21, No.3, pp. 403-411, 2009. T. McGeer, “Stability and control of two-dimensional biped walking,” CSS-IS TR 88-01, 1988. T. Kinugasa, K. Yoshida, and S. Fujimoto, “Biped Walking Using Thrust via Upper Body Inclination: – Analysis of Walking and a Study for Experimental Realization Using Geometric Tracking Control –,” J. of the Robotics Society, Vol.32, No.2, pp. 183-189, 2014 (in Japanese). A. Goswami, B. Espiau, and A. Keramane, “Limit cycles in a passive compass gait biped and passivity-mimicking control laws,” J. of Autonomous Robots, Vol.4, No.3, pp. 273-286, 1997. F. Asano and M. Yamakita, “Virtual gravity and coupling control for robotic gait synthesis,” Trans. on Systems, Man, and Cybernetics, Part A: Systems and Human, Vol.31, No.6, pp. 737-745, 2001. F. Asano, Z.-W. Luo, and M. Yamakita, “Gait Generation and Control for Biped Robots Based on Passive Dynamic Walking,” J. of the Robotics Society of Japan, Vol.22, No.1, pp. 130-139, 2004 (in Japanese). F. Asano, M. Yamakita, N. Kamamichi, and Z. W. Luo, “A Novel Gait Generation for Biped Walking Robots Based on Mechanical Energy Constraint,” IEEE Trans. on Robotics and Automation, Vol.20, No.3, 2004. M. W. Spong and F. Bullo, “Controlled symmetries and passive walking,” IEEE Trans. on Automatic Control, Vol.50, No.7, pp. 1025-1031, 2005. K. Ono and T. Okada, “Self-excited vibratory actuator (3rd report), biped walking mechanism by self-excitation,” J. of the Japan Society of Mechanical Engineers, Vol.60, No.579, pp. 125-132, 1994 (in Japanese). K. Ono, R. Takahashi, and T. Shimada, “Self-excited walking of a biped mechanism,” Int. J. of Robotics Research, Vol.23, No.1, pp. 55-68, 2004. R. Ito, H. Minakata, and S. Tadakuma, “An Experimental Study of Pseudo Passive Locomotion,” The 19th Annual Conf. of the robotics Society of Japan, pp. 835-836, 2001 (in Japanese). T. Kinugasa, K. Osuka, and S. Miwa, “Biped Walking by Variations of Knee Lengths and Attitude Control of a Body and its Frequency Analysis,” J. of Robotics Society of Japan, Vol.25, No.3, pp. 440-447, 2007 (in Japanese). H. Minakata and S. Tadakuma, “An Experimental Study of Passive Dynamic Walking with Non-rotate Knee Joint Biped,” Proc. of ICASE/SICE Workshop Intelligent Control and Systems, pp. 298-303, 2002. S. Miyakoshi and G. Cheng, “Examining Human Walking Characteristics with a Telescopic Compass-like Biped Walker Model,” Proc. of IEEE SMC, pp. 1538-1543, 2004. T. Kinugasa, K. Ando, S. Fujimoto, and M. Iribe, “Development of a three-dimensional dynamic biped walking via the oscillation of telescopic knee joint and its gait analysis,” J. of Mechanical Engineering and Sciences, Vol.9, No.1529-1537, 2015. F. Asano and Z. W. Luo, “Energy-efficient and high-speed dynamic biped locomotion based on principle of parametric excitation,” IEEE Trans. on Robotics, Vol.24, No.6, pp. 1289-1301, 2008. Y. Harata, F. Asano, K. Taji, and Y. Uno, “Efficient parametric excitation walking with delayed feedback control,” Nonlincar Dynamics, Vol.67, pp. 1327-1335, 2012. M. Wisse, A. Schwab, R. v. d. Linde, and F. v. d. Helm, “How to keep from falling forward: elementary swing leg action for passive dynamic walkers,” IEEE Trans. on Robotics, Vol.21, No.3, pp. 292-401, 2005. A. D. Kuo, “Energetics of actively powered locomotion using the simplest walking model,” J. of Biomechanical Eng., Vol.124, pp. 113-120, 2002. S. H. Collins and A. Ruina, “A bipedal walking robot with efficient and human-like gait,” Proc. of Int. Conf. on Robotics and Automation, pp. 1983-1988, 2005. C. G. A. J. Morimoto, “Learning biped locomotion,” Robotics and Automation Magazine, Vol.14, No.2, pp. 41-51, 2007. R. Tedrake and T. Z. a. Seung, “Stochastic Policy Gradient Reinforcement Learning on a Simple 3D Biped,” Proc. of Intelligent Robots and Systems, 2004. E. R. Westerbelt, B. Morris, and K. D. Farrell, “Sample-based HZD control for robustness and slope invariance of planar passive bipedal gait,” 14th Meditrranean Conf on Control and Automation, pp. 1-6, 2006. K. Hosoda, T. Takuma, A. Nakamoto, and S. Hayashi, “Biped Robot Design Powered by Antago-nistic Pneumatic Actuators for Multi-Modal Locomotion,” Robotics and Autonomous Systems, Vol.56, No.1, pp. 46-53, 2008. K. Narioka and K. Hosda, “Study on Locomotion of Musculoskeletal Humanoid,” J. of Robotics Society of Japan, Vol.30, No.1, pp. 8-13, 2012. K. Narioka and K. Hosoda, “3D Dynamic Walking of Biped driven by Pneumatic Artificial Muscles,” Proc. of the 2007 JSME Conf. on Robotics and Mechatronics, pp. 1P1-F04, 2007 (in Japanese). K. Narioka, T. Homma, and K. Hosoda, “Designing synergistic walking of a whole-body humanoid driven by pneumatic artificial muscles: An empirical study,” Advanced Robotics, Vol.22, No.10, pp. 1107-1123, 2008. K. Narioka, T. Homma, and K. Hosoda, “Humanlike Ankle-foot Complex for a Biped Robot,” Proc. of 2012 12th Int. Conf. on Humanoid Robots, pp. 15-22, 2012. D. Ura, M. Iribe, K. Osuka, and T. Kinugasa, “Legged Walking Robot Design Applying a Behavior of Passive Dynamic Walking: Joint D.O.F Alignment Design Applying the Adaptive Function,” Trans. of the Society of Instrument and Control Engineers, Vol.51, No.5, pp. 737-742, 2015 (in Japanese). G. Taga, Y. Yamaguchi, and H. Shimizu, “Self-organized control of bipedal locomotion by neural oscillators in unpredictable environment,” Biological Cybernetics, Vol.65, No.3, pp. 147-159, 1991. T. Yamasaki, T. Nomura, and S. Sato, “Phase reset and dynamic stability during human gait,” BioSystem, Vol.71, No.1-2, pp. 221-232, 2003. S. Aoi and K. Tsuchiya, “Locomotion control of a biped robot using nonlinear oscillators,” Autonomous Robots, Vol.19, No.3, pp. 219-232, 2005. G. Endo, J. Morimoto, J. Nakanishi, and G. Cheng, “An Empirical Exploration of a Neural Oscillator for Biped Locomotion Control,” Proc. of the 2004 IEEE ICRA, pp. 3036-3042, 2004. Y. Nakamura, M. Sato, and S. Ishii, “Acquisition of locomotion by reinforcement learning using neural oscillator network,” Technical report of the Inst. of Electronics, Information and Communication Engineers, pp. 183-190, 2002. G. Endo, J. Morimoto, T. Matsubara, J. Nakanishi, and G. Cheng, “Learning CPG-based biped locomotion with a Policy gradient method: application to a humanoid robot,” Int. J. of Robotics Research, pp. 213-228, 2008. S. Aoi, N. Ogihara, T. Funato, Y. Sugimoto, and K. Tsuchiya, “Evaluating functional roles of phase resetting in generation of adaptive human bipedal walking with a physiologically based model of the spinal pattern generator,” Biological Cybernetics, Vol.102, No.5, pp. 373-387, 2010. A. Ishiguro, “How animals exhibit agile and adaptive locomotion? synthetic approach via cooperation between biology, mathematics, and robotics,” Proc. of the Symposium on Simulation of Traffic Flow, Vol.17, 2011. H. Fukuda, D. Owaki, and A. Ishiguro, “Experimental Verification of Adaptive Bipedal Walking Based on CPG Control That Exploits Superficial Sensation from Feet,” Proc. of the 2012 JSME Conf. on Robotics and Mechatronics, pp. 2P1-H03, 2012 (in Japanese). D. Wilson, “Insect walking,” Annual review of entomology, Vol.11, No.1, pp. 103-122, 1965. S. Kuroda, I. Kunita, Y. Tanaka, A. Ishiguro, R. Kobayashi, and T. Nakagaki, “Common mechanics of mode switching in locomotion of limbless and legged animals,” J. of the Royal Society, Interface / the Royal Society, Vol.11, No.95, p. 20140205, 2014. M. Cartmill, P. Lemelin, and D. Schmitt, “Support polygons and symmetrical gaits in mammals,” Zoological J. of the Linnean Society, Vol.136, No.3, pp. 401-420, 2002. M. Hildebrand, “The Adaptive Significance of Tetrapod Gait Selection,” Integrative and Comparative Biology, Vol.20, No.1, pp. 255-267, 1980. G. M. Hughes, “The Co-Ordination of Insect Movements,” J. of Experimental Biology, Vol.29, No.2, pp. 267-285, 1952. D. F. Hoyt and C. R. Taylor, “Gait and the energetics of locomotion in horses,” Nature, Vol.292, No.5820, pp. 239-240, 1981. D. Graham, “A behavioural analysis of the temporal organisation of walking movements in the 1st instar and adult stick insect (Carausius morosus),” J. of Comparative Physiology, Vol.81, No.1, pp. 23-52, 1972. B. Mcghee, “Some Finite State Aspects of Legged Locomotion,” Mathematical Biosciences, Vol.2, No.1, pp. 67-84, 1968. R. B. Mcghee and A. A. Fkask, “On the stability properties of quadruped creeping gaits,” Mathematical Biosciences, Vol.3, pp. 331-351, 1968. H. Miura, I. Shimoyama, M. Mitsuishi, and H. Kimura, “Dynamical walk of quadruped robot (Collie-1),” Int. Symp. Robotics Research, pp. 317-324, 1985. M. H. Raibert, “Trotting, pacing and bounding by a quadruped robot,” J. of biomechanics, Vol.23, pp. 7983-8198, 1990. M. Raibert, K. Blankespoor, G. Nelson, and R. Playter, “BigDog, the Rough-Terrain Quadruped Robot,” Proc. of the 17th World Congress The Int. Federation of Automatic Control, Vol.17, No.1, pp. 10822-10825, 2008. A. Rosendo, S. Nakatsu, K. Narioka, and K. Hosoda, “Pneupard: A biomimetic musculoskeletal approach for a feline-inspired quadruped robot,” IEEE Int. Conf. on Intelligent Robots and Systems, pp. 1452-1457, 2013. S. Seok, A. Wang, M. Y. Chuah, D. J. Hyun, J. Lee, D. M. Otten, J. H. Lang, and S. Kim, “Design Principles for Energy-Efficient Legged Locomotion and Implementation on the MIT Cheetah Robot,” IEEE/ASME Trans. on Mechatronics, Vol.20, No.3, pp. 1117-1129, 2014. K. Narioka, A. Rosendo, A. Sproewitz, and K. Hosoda, “Development of a minimalistic pneumatic quadruped robot for fast locomotion,” IEEE Int. Conf. on Robotics and Biomimetics (ROBIO 2012), pp. 307-311, 2012. F. Iida, G. Gomez, and R. Pfeifer, “Exploiting body dynamics for controlling a running quadruped robot,” Proc. of Int. Conf. on Advanced Robotics (ICAR ’05), pp. 229-235, 2005. A. Smith and M. Berkemeier, “Passive dynamic quadrupedal walking,” Proc. of Int. Conf. on Robotics and Automation (ICRA1997), Vol.1, pp. 34-39, 1997. C. D. Remy, K. Buffinton, and R. Siegwart, “Stability Analysis of Passive Dynamic Walking of Quadrupeds,” The Int. J. of Robotics Research, Vol.29, No.9, pp. 1173-1185, 2009. K. Nakatani, Y. Sugimoto, and K. Osuka, “Demonstration and Analysis of Quadrupedal Passive Dynamic Walking,” Advanced Robotics, Vol.23, No.5, pp. 483-501, 2009. C. D. Remy, M. Hutter, and R. Siegwart, “Passive dynamic walking with quadrupeds – Extensions towards 3D,” Proc. of 2010 IEEE Int. Conf. on Robotics and Automation (ICRA2010), pp. 5231-5236, May 2010. R. Inoue, F. Asano, D. Tanaka, and I. Tokuda, “Passive Dynamic Walking of Combined Rimless Wheel and Its Speeding-up by Adjustment of Phase Difference,” Proc. of 2011 IEEE/RSJ Int. Conf. on Intelligent Robots and Systems, pp. 2747-2752, 2011. D. Tanaka, F. Asano, I. Tokuda, and A. P. C. R. W. Machine, “Gait analysis and efficiency improvement of passive dynamic walking of combined rimless wheel with wobbling mass,” Proc. of 2012 IEEE/RSJ Int. Conf. on Intelligent Robots and Systems, pp. 151-156, 2012. 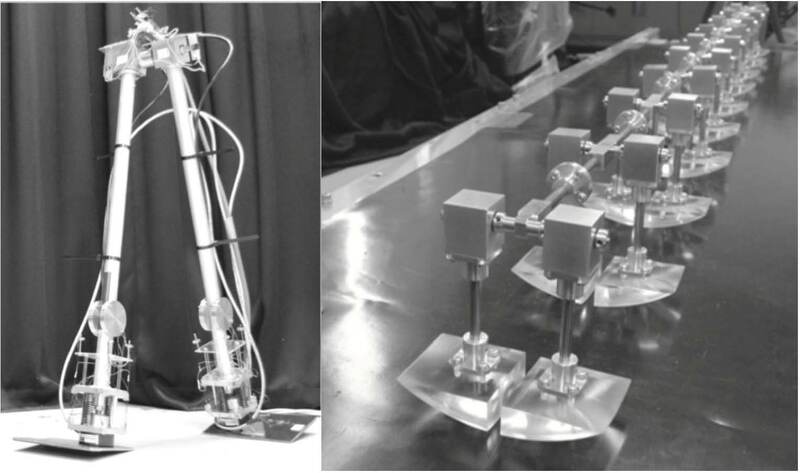 T. Kibayashi, Y. Sugimoto, M. Ishikawa, K. Osuka, and Y. Sankai, “Experiment and analysis of quadrupedal quasi-passive dynamic walking robot “Duke”,” Proc. of 2012 IEEE/RSJ Int. Conf. on Intelligent Robots and Systems (IROS2012), pp. 299-304, 2012. T. Okamoto, Y. Sugimoto, Y. Sueoka, and K. Osuka, “Analyses of gait transition In quasi-passive dynamic walking locomotion,” Advances in Cooperative Robotics: Proc. of the 19th Int. Conf. on Clawar 2016, p. 412, 2016. S. Grillner, “Control of locomotion in bipeds, tetrapods, and fish,” Handbook of Physiology, The Nervous System II, pp. 1179-1236, 1981. M. Shik, F. Severin, and G. N. Orlovskivi, “Control of walking and running by means of electrical stimulation of mid-brain,” Biophysics, Vol.11, No.4, pp. 659-666, 1966. A. J. Ijspeert, “A connectionist central pattern generator for the aquatic and terrestrial gaits of a simulated salamander,” Biological Cybernetics, Vol.84, No.5, pp. 331-348, 2001. A. J. Ijspeert, “Central pattern generators for locomotion control in animals and robots: A review,” Neural Networks, Vol.21, No.4, pp. 642-653, 2008. Y. Fukuoka, H. Kimura, and A. H. Cohen, “Adaptive running of a quadruped robot on irregular terrain based on biological concepts,” The Int. J. of Robotics Researc, Vol.22, No.3-4, pp. 187-202, 2003. A. J. Ijspeert, A. Crespi, D. Ryczko, and J.-M. Cabelguen, “From swimming to walking with a salamander robot driven by a spinal cord model,” Science, Vol.315, No.5817, pp. 1416-1420, 2007. H. Kimura, Y. Fukuoka, and A. H. Cohen, “Adaptive Dynamic Walking of a Quadruped Robot on Natural Ground Based on Biological Concepts,” The Int. J. of Robotics Research, Vol.26, No.5, pp. 475-490, 2007. H. Kimura, S. Akiyama, and K. Sakurama, “Realization of dynamic walking and running of the quadruped using neural oscillator,” Autonomous Robots, Vol.7, No.3, pp. 247-258, 1999. K. Tsujita, K. Tsuchiya, and A. Onat, “Adaptive Gait Pattern Control,” Proc of 2001 IEEE/RSJ Int. Conf. on Intelligent Robots and Systems (IROS2001), Vol.3, pp. 2318-2325, 2001. K. Tsujita, K. Tsuchiya, and A. Onat, “Decentralized autonomous control of a quadrupedal locomotion robot using oscillators,” Artificial life and robotics, Vol.5, No.3, pp. 152-158, 2001. S. Aoi, T. Yamashita, A. Ichikawa, and K. Tsuchiya, “Hysteresis in gait transition induced by changing waist joint stiffness of a quadruped robot driven by nonlinear oscillators with phase resetting,” Proc. of IEEE/RSJ 2010 Int. Conf. on Intelligent Robots and Systems (IROS2010), pp. 1915-1920, 2010. M. Golubitsky, I. Stewart, P.-L. L. Buono, and J. J. Collins, “Symmetry in locomotor central pattern generators and animal gaits,” Nature, Vol.401, No.6754, pp. 693-695, 1999. L. Righetti and A. J. Ijspeert, “Pattern generators with sensory feedback for the control of quadruped locomotion,” Proc. of IEEE Int. Conf. on Robotics and Automation, pp. 819-824, 2008. R. Altendorfer, N. Moore, H. Komsuoglu, M. Buehler, H. B. Brown, D. Mcmordie, U. Saranli, R. Full, and D. E. Koditschek, “RHex: A biologically inspired hexapod runner,” Autonomous Robots, Vol.11, No.3, pp. 207-213, 2001. U. Saranli, M. Buehler, and D. E. Koditschek, “RHex: A Simple and Highly Mobile Hexapod Robot,” The Int. J. of Robotics Research, Vol.20, pp. 616-631, July 2001. D. W. Haldane and R. S. Fearing, “Running beyond the bio-inspired regime,” Proc. of 2015 IEEE Int. Conf. on Robotics and Automation (ICRA2015), pp. 4539-4546, 2015. D. W. Haldane, K. C. Peterson, F. L. Garcia Bermudez, and R. S. Fearing, “Animal-inspired design and aerodynamic stabilization of a hexapedal millirobot,” Proc. of IEEE Int. Conf. on Robotics and Automation, pp. 3279-3286, 2013. Y. Sugimoto, H. Yoshioka, and K. Osuka, “Realization and Motion Analysis of Multi-legged Passive Dynamic Walking,” Proc. of SICE Annual Conf. 2010, Taipei, 2010. Y. Sugimoto, H. Yoshioka, and K. Osuka, “Development of Super-multi-legged Passive Dynamic Walking Robot,” Proc. of SICE Annual Conf. 2011 (SICE2011), pp. 576-579, 2011. T. Kinugasa, K. Osuka, R. Hayashi, N. Miyamoto, and K. Yoshida, “Development of Lightweight and Small Myriapod Robot using Mechanical Passivity,” Proc. of 22nd Int. Symposium on Artificial Life and Robotics, 2017. K. Osuka, T. Kinugasa, R. Hayashi, K. Yoshida, D. Owaki, and A. Ishiguro, “Development of Implicit Controlled Centipede Robot (i-CentiPot),” Proc. of SICE Symposium on Decentralized Autonomous Systems, 1A2-1, 2017 (in Japanese). F. Delcomyn, “Walking robots and the central peripheral of locomotion in insects,” Autonomous Robots, Vol.7, No.3, pp. 259-270, 1999. K. S. Espenschied, R. D. Quinn, R. D. Beer, and H. J. Chiel, “Biologically based distributed control and local reflexes improve rough terrain locomotion in a hexapod robot,” Robotics and Autonomous Systems, Vol.18, No.1-2, pp. 59-64, 1996. J. C. Gallagher, R. D. Beer, K. S. Espenschied, and R. D. Quinn, “Application of evolved locomotion controllers to a hexapod robot,” Robotics and Autonomous Systems, Vol.19, No.1, pp. 95-103, 1996. Y. Ambe, T. Nachstedt, P. Manoonpong, F. Worgotter, S. Aoi, and F. Matsuno, “Stability analysis of a hexapod robot driven by distributed nonlinear oscillators with a phase modulation mechanism,” Proc. of IEEE Int. Conf. on Intelligent Robots and Systems, pp. 5087-5092, 2013. P. Arena, L. Fortuna, M. Frasca, and G. Sicurella, “An adaptive, self-organizing dynamical system for hierarchical control of bio-inspired locomotion,” IEEE Trans. on Systems, Man, and Cybernetics, Part B: Cybernetics, Vol.34, No.4, pp. 1823-1837, 2004. S. Inagaki, H. Yuasa, and T. Arai, “CPG model for autonomous decentralized multi-legged robot system – Generation and transition of oscillation patterns and dynamics of oscillators,” Robotics and Autonomous Systems, Vol.44, No.3-4, pp. 171-179, 2003. S. Inagaki, H. Yuasa, T. Suzuki, and T. Arai, “Wave CPG model for autonomous decentralized multi-legged robot: Gait generation and walking speed control,” Robotics and Autonomous Systems, Vol.54, No.2, pp. 118-126, 2006. M. Schilling, T. Hoinville, J. Schmitz, and H. Cruse, “Walknet, a bio-inspired controller for hexapod walking,” Biological Cybernetics, Vol.107, No.4, pp. 397-419, 2013. T. Ohnishi and T. Asakura, “Spider-Robot 8-Leg Cooperative Walking Velocity Control Strategy Based on Environmental Information,” JSME Int. J. Series C, Vol.47, No.4, pp. 1101-1107, 2004. B. Klaassen, R. Linnemann, D. Spenneberg, and F. Kirchner, “Biomimetic walking robot SCORPION: Control and modeling,” Robotics and Autonomous Systems, Vol.41, No.2-3, pp. 69-76, 2002. M. Goda, S. Miyazawa, S. Itayama, D. Owaki, T. Kano, and A. Ishiguro, “Understanding Interlimb Coordination Mechanism of Hexapod Locomotion via “TEGOTAE”-Based Control,” Proc. of Conf. on Biomimetic and Biohybrid Systems, pp. 441-448, 2016. S. Aoi, Y. Egi, and K. Tsuchiya, “Instability-based mechanism for body undulations in centipede locomotion,” Physical Review E – Statistical, Nonlinear, and Soft Matter Physics, Vol.87, No.1, pp. 1-11, 2013. S. Aoi, T. Tanaka, S. Fujiki, T. Funato, K. Senda, and K. Tsuchiya, “Advantage of straight walk instability in turning maneuver of multilegged locomotion: a robotics approach,” Scientific Reports, Vol.6, 30199, April 2016. S. Inagaki, T. Niwa, and T. Suzuki, “Follow-the-contact-point gait control of centipede-like multi-legged robot to navigate and walk on uneven terrain,” Proc. of IEEE/RSJ 2010 Int. Conf. on Intelligent Robots and Systems (IROS2010), pp. 5341-5346, 2010. T. Kano, K. Yasui, D. Owaki, and A. Ishiguro, “Decentralized Control Scheme for Myriapod Locomotion That Exploits Local Force Feedback,” Conf. on Biomimetic and Biohybrid Systems, pp. 449-453, 2016. L. Matthey, L. Righetti, and A. J. Ijspeert, “Experimental study of limit cycle and chaotic controllers for the locomotion of centipede robots,” Proc. of 2008 IEEE/RSJ Int. Conf. on Intelligent Robots and Systems, pp. 1860-1865, 2008. R. Takahashi and S. Inagaki, “Walk control of segmented multi-legged robot based on integrative control of legs and 2-DoF active intersegment joints,” Advanced Robotics, Vol.30, No.20, pp. 1354-1364, 2016. T. Wei, Q. Luo, Y. Mo, Y. Wang, and Z. Cheng, “Design of the three-bus control system utilising periodic relay for a centipede-like robot,” Robotica, Vol.34, pp. 1-14, 2014. Z. P. Dederick. “Steam Carriage,” U.S. Patent, No.75874, 1868. R. D. Beer, R. D. Quinn, H. J. Chiel, and R. E. Ritzmann, “Biologically inspired approaches to robotics: What can we learn from insects?,” Communications of the ACM, Vol.40, No.3, pp. 30-38, 1997. R. E. Ritzmann, R. D. Quinn, J. T. Watson, and S. N. Zill, “Insect Walking and Biorobotics: A Relationship with Mutual Benefits,” BioScience, Vol.50, No.1, p. 23, 2000. A. J. Ijspeert, “Biorobotics: using robots to emulate and investigate agile locomotion.,” Science (New York, N.Y.), Vol.346, No.6206, pp. 196-203, 2014. J. H. Long, “Biomimetic robotics: self-propelled physical models test hypotheses about the mechanics and evolution of swimming vertebrates,” Proc. of the Institution of Mechanical Engineers Part C, J. of Mechanical Engineering Science, Vol.221, No.10, pp. 1193-1200, 2007. B. Webb, “Can robots make good models of biological behaviour?,” The Behavioral and brain sciences, Vol.24, No.6, pp. 1033-1050, 2001. R. Pfeifer and J. Bongard, “How the body shapes the way we think: a new view of intelligence,” MIT press, 2007.